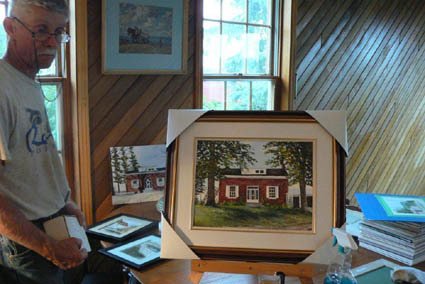 "The Farmer framing his art"
Eric enjoys working with watercolour, palette knife oil and pen and ink. Which cheese do I want for lunch? We carry Thornloe & Wilton cheese in the store. Our own organic beef is now in Pepperettes and Summer Sausage. They are available at all times. Great for snacking, charcuterie boards, hostess gifts or whatever idea you have for them. 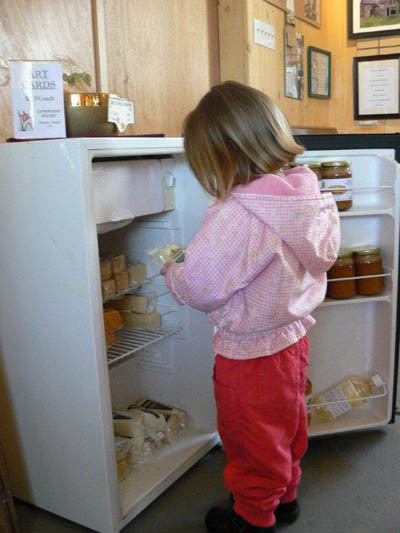 We are also selling Thorneloe Grass fed Butter ( salted and unsalted) and medium Grass fed cheese. Using what nature provides and combining that with semi-precious gem stones or glass beads, Barb’s designs bring life to wire. Her creations include an array of tree of life designs some of which she has had the privilege to exhibit as part of a corporate art display. Painting has been a life long passion for MARNI. Monotype printing integrates the traditional techniques of painting and printmaking where images are created by impressing soaked paper against a painted plate.This is achieved by running the painted surface and paper through a press , turned and then pulled back by hand. This process allows MARNI to use variegated layers of water colour pigments to create several prints - each with their own unique colour, texture and design. She may also add a touch of hand painting or drawing to some that gives it another dimension of individuality. Jennifer Griffin is very passionate about her crochet/knit functional crafts. She creates hats, scarves and mittens for all ages and interests. If your coffee or tea mug needs a cozy she does that too. Jennifer creates warm cozy afghans for babies through to grandma. Her produce/market bags will be a very pretty but environmental addition to your shopping trip. She makes all her quality items with love and care so come out to the shop and see what we have. If we don’t have it we will put you in touch with Jennifer. Stephanie developed an interest in creating her own line of natural hand crafted herbal health products and because of this she studied herbal medicine and aroma therapy. Armed with this knowledge and very strong feelings about using natural ingredients Stephanie has created a line of products for simple healthy living. She and her Mom, Ginette Vachon have been perfecting their product for four years. We are happy to have Tranquility Matters join the team at Gallery on the Farm. Lavender-Blu has been hand-crafting value added lavender products and teaching the public about the multifaceted beauty of lavender. 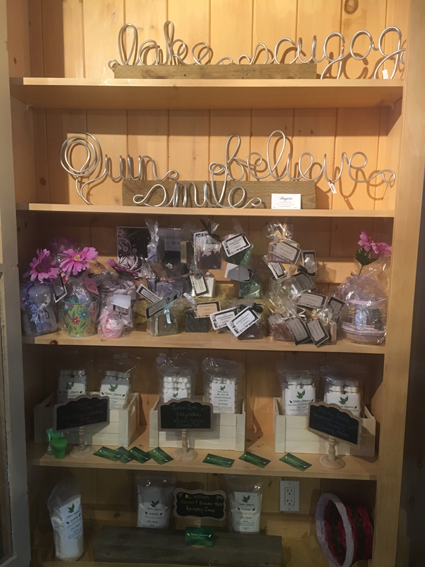 Lavender-Blu is a small family business and their mandate is to beautify our community, to create unique hand-made artisan products as well as to educate individuals on the subject of lavender. John Goslinga creates useful and decorative wood turned pieces to be used in your everyday living. Use these unique pieces on your table or hang one in your window. The Wilton Cheese Factory operated as a Farmer's Co-operative from 1867 to 1970 when it was purchased but the Jensen family. They have continued with the traditions of making artisan cheddar Cheese with old fashioned full bodied natural flavour. Crystal of Timeless Essentials is a certified herbologist.. She has a full line of handmade all natural soaps, bath and body products. 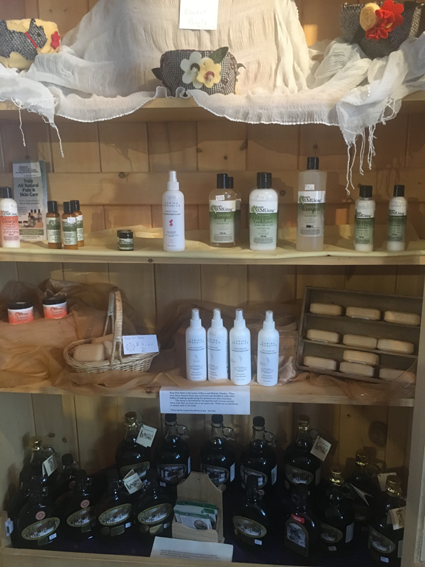 We carry just a few of her products – glycerine soap, lip balms, bug spray. Her store is located in Enniskillen. Tasha bakes pies, butter tarts, and cookies/square for our special events only. Another great reason to come to the events! will add a little sweetness to your life and living. You have all been asking for local honey and “Hugs and Honey” ( Steve Bowman) has filled the bill. Our newest delicious product is Cinnamon Honey Butter. maple syrup will add the final touch to desserts, pancakes, waffles. has some unique pieces of pottery for that special person on your gift list. Get your apple cider in a “Bag in a Box.” The Geissbergers have perfected this new process and have created new flavours of apple cider – Apple Carrot, Apple Cranberry Apple Pear which can be purchased on availability. They are also known for their delicious sparking cider. has a variety of palette knife oil and watercolour paintings. He will do commissions if you have some history that you want preserved. Dianne Darch is a pen, ink and watercolour artist whose artwork depicts nature to the fullest. Peggy Darch, a talented quilter offers unique items for the home and more. Come visit the shop and see the original cards and quilted items we have for sale. Helen Iredale- Make It Yours!! We are now carrying some wonderful pieces of stained glass. Helen creates some very interesting and unusual pieces . Creations featuring custom stained glass sun catchers and small panels. Please check out examples at www.makeityours.ca. You can also order embossed napkins, ribbon, and custom wine labels for your next event. Nancy Traviss grew up in the Enniskillen area on land originally owned by her grandfather and hence the name Homestead Studio Glass. Nancy now works out of her home studio in Bowmanville making original fused and lampwork glass creations. Nancy uses a torch and kiln to craft beads and glass pieces that are handcrafted into jewelry and ornaments. Mostly self-taught, she continues to learn her craft and hone her skills. Hi. My name is Anya and I am a Whitby, Ontario artist. I am a mixed media sculptor. I come from a long line of makers and creative people who have inspired me throughout my life. Both of my grandmothers were skilled seamstresses who made clothes and home décor items, usually without patterns. My grandfather was a cobbler who made and repaired shoes and leather goods. My mother sewed most of my clothes and skillfully designed and created crochet clothes for my Barbie dolls when I was a child. My aunt created beautiful cross stitch pictures and often dyed her own threads. My favourite materials to work with are textiles and wood. Much of the material used in my projects and reclaimed and recycled. I often integrate items that I have gathered during walks on the beach or through woods. I save my finds until I have the perfect piece in mind. I love to incorporate unusual materials and bright colours into my work. Most of the pieces you see are weather resistant and can be used to enhance your garden or any other indoor space. Be sure to look at the gallery on my website (Art By Miss Anya.com) to see what pieces I have available, or to get inspiration for your own custom work of art. Brandy Gibbons currently lives in Petawawa with her husband and two children. Being a part of a military family means moved from one place to another is a regular occurrence. Brandy started making soap about 2 years ago as a stress reliving hobby. She taught herself to make soap using basic household oils and lye then expanded to using manmade and natural colourants and fragrances. Her soap is beautiful, creative functional art. © 2016 Gallery on the Farm. All rights Reserved.